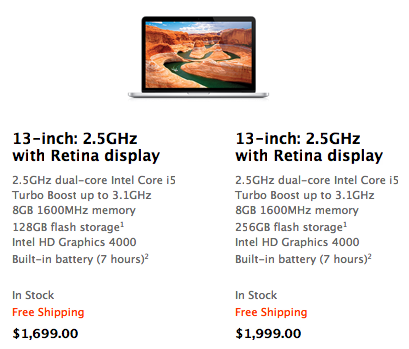 Why there are two 13-inch MacBook Pro Retina Display Price Points? Apple introduced 13-inch MacBook Pro with Retina Display last week. They introduced not just one but two at two different price points. Did they really need the 256GB version at $1,999 price point? After all the 128GB version is configurable. One can select 128GB version and configure it as 256GB for additional $300.